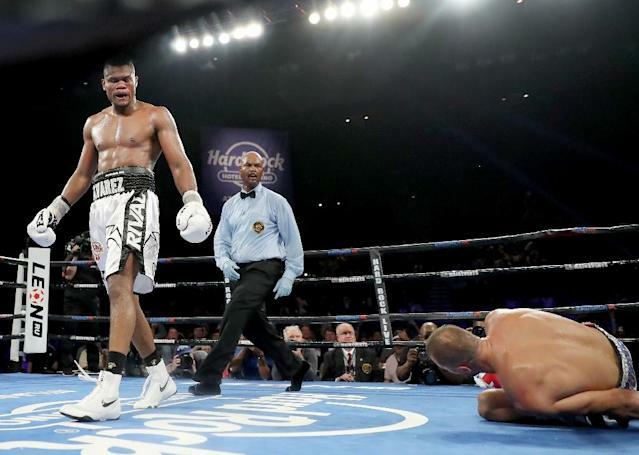 New York (AFP) - Unbeaten Eleider Alvarez stunned Sergey Kovalev on Saturday, knocking the Russian champion down three times in the seventh round to capture the World Boxing Organization light heavyweight title. Alvarez hit Kovalev with a powerful combination that sent him to the canvas for the final knockdown of the fight at 2:45 of the seventh to give the Colombian his first world title. "I just can't describe how I feel," Alvarez said. "I wanted to show him that I am strong, I have a good chin and am ready for big things." The 35-year-old Kovalev was trying to re-establish his dominance in the light heavyweight division in his first real boxing test since losing in back-to-back fights to Andre Ward in November 2016 and June 2017. He knocked Kovalev down the first time with an overhand right to the side of the head and the second time with a left hook and a straight right to the forehead. He then finished him off with a right hook and left uppercut combination and at that point the referee stepped in with 15 seconds before the bell in front of a crowd of 5,600 at the Hard Rock Hotel in Atlantic City, New Jersey. Kovalev was taken to the hospital after the fight to receive medical treatment. "I feel OK. Thank you everyone, thank you very much to all the fans around the world for your support," Kovalev said. "I love you, and I'm fine." It may have hurt Kovalev that his two most recent fights -- after losing his titles to Ward -- were victories over weak opponents. With this loss he drops to a record of 32-3-1, while Alvarez, who is based in Montreal, Canada, improved to 24-0 with 12 knockouts. The opportunity to win his first title is something the heavy underdog Alvarez, 34, has been awaiting for a long time. The 2008 Colombian Olympian had to go through plenty of adversity to finally become a boxing champion. He was the mandatory challenger for WBC titleholder Adonis Stevenson for more than two years. 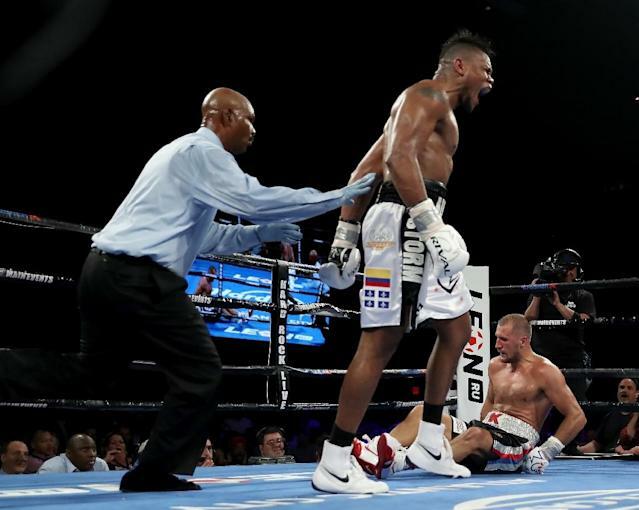 But Stevenson kept side stepping Alvarez and that left him with the next best option: to make a fight with the dangerous power puncher Kovalev. 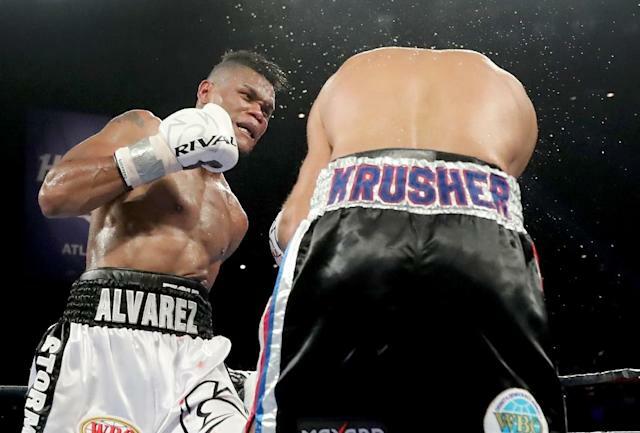 "We slowed him a bit and I felt his punches weren't as hard as they were at the beginning of the fight," Alvarez said. "That was a two-punch knockout. We practised that punch in training camp." Meanwhile, the result derails plans for a light heavyweight unification bout between Kovalev and Dmitry Bivol, who retained his World Boxing Association belt with a unanimous decision over Isaac Chilemba on the same card. Bivol controlled the early and middle rounds but seemed to tire near the end as Chilemba started to win some rounds. Bivol did enough to win but failed to get the knockout that many had predicted before the fight. One judge scored the fight 116-112 for Bivol, while the other two had it 120-108.